Children will love the addition of dinosaur bedding in their bedrooms. Cartoon and other friendly dinosaur patterns can be a cute decorating style for baby and toddler rooms. Older children will appreciate true to life dinosaur scenes and famous dinosaur characters such as Barney. There are dozens of sheets, comforts and quilt sets to choose from in this style. Dinosaur bedding is a cute and unique addition to baby and toddler rooms. For babies and young children you should choose a style that has a whimsical and lighthearted feel. Dinosaur patterns in green, blue, tan, and orange work well in a boy's room, and dinosaur patterns in bright colors like neon green, yellow, purple, and pink work well in a girl's room. Some styles feature dinosaur footprints rather than the creatures themselves that gives a fun nod to the dinosaur theme in a more sophisticated way. To complete the look of any young child's or baby's room, you can add matching curtains, rugs with a jungle pattern or even dinosaur-shaped throw pillows. Many boys and some girls go through a dinosaur phase and even older children don't have to put aside a love for dinosaurs. Once children start school, they learn about dinosaurs and many children begin wanting dinosaur toys and books for playing and learning. 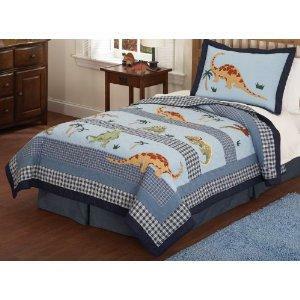 You can add to your child's overall learning and enjoyment with dinosaur bedding for his bedroom. More subdued colors and sophisticated dinosaur prints or embroidered dinosaur bedding designs are great for bigger kids who love these prehistoric creatures. Dinosaur patterns meant for older children often have realistic pictures of dinosaurs; some are very educational with printing onto the sheets that include the dinosaur names and regional locations they were known to inhabit. Movies, books and television shows have brought dinosaurs to life for many children. One of the most popular examples of an iconic Dinosaur is Barney. Toddlers and preschoolers love Barney and his face can be found on many sheet sets. Other popular dinosaur stories include Jurassic Park and the Disney classic, Land Before Time. You have dozens of online and retail store options to consider when looking for dinosaur sheets and bedding sets. Wal-Mart carries an assortment of children's bedding that features dinosaurs. For example, the Dinosaur four-Piece Toddler Bedding set has a brightly colored bedspread in green, orange and purple with a matching set of white sheets with a printed dinosaur design. The entire set features whimsical, happy dinosaurs. While mostly thought of as a toy store, Toys "R" Us sells bedding and other linens designed for children. For example, the Dino Two-Piece Bedding Set by Anna Claire includes a nice white quilt with a minimalist dinosaur design and a matching sham. Amazon carries a wide array of bedding for children, toddlers and babies. Amazon sells items from all over the world made by dozens of different designers. If you are looking for bedding that features well-known children's dinosaurs like Barney or the cast from Land Before Time, this is a good place to start. Target carries an impressive amount of children's bedding. The company updates the bedding styles several times throughout the year so you are likely to find at least one style of your child's favorite dinosaur. Wherever you purchase new bedding, be sure to keep your child's age and interests in mind. Young children may find graphic or true-to-life dinosaur prints frightening, while older children will have likely outgrown Barney and other famous characters, making realistic or more subtle pictures of dinosaurs more fitting. Better still, have your child come with you on the shopping trip and choose his own sheets and comforter set. It could be a very rewarding shopping experience for both of you.